Named for Sir Henry Bartle Edward Frere (1815 - 1884) FRS, 1st Governer of Bombay, botanist. This monotypic genus contains the endangered stem succulent Frerea indica. This stapeliad is native to hilly forests of Maharashtra, India, with a very limited distribution of plants growing in crevices of cliffs at altitudes of around 3000 ft. 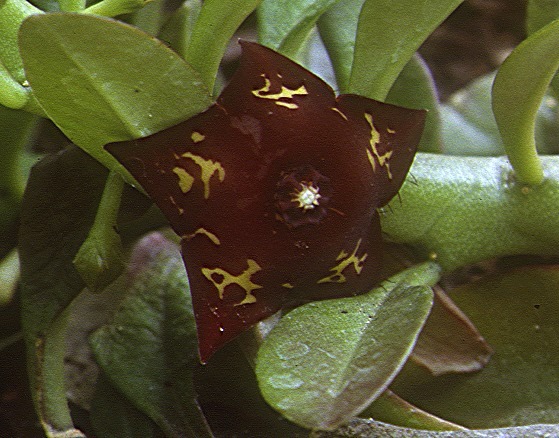 Although widely cultivated, it is considered endangered in its habitat, through habitat loss and erosion and dependence on specific pollinators required for the tricky pollination mechanism of Asclepiadaceae. Frerea indica is unusual among stapeliads in having leafy stems. 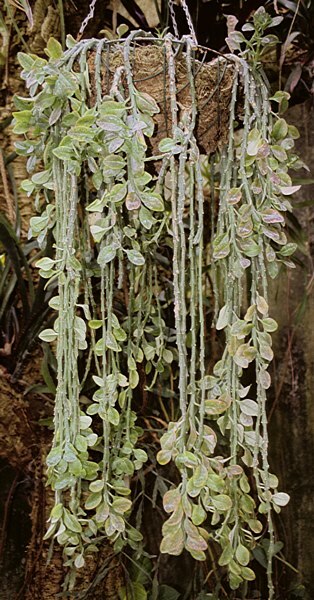 The succulent leaves grow during seasonal rain and can be shed in dry conditions as a water conservation mechanism, further assisted by development of a reflective silvery surface to the stems. The flowers of some clones have ciliated edges, although only a few black hairs are visible at the right hand edge of this flower. Some clonal variation is also recorded in the ratio of purple and yellow markings on the petals. Although it is thought that its natural pollinators may have gone extinct, foul odours from the flowers attract flies and ants to pollinate cultivated plants. Flowers are followed by seed horns containing seeds packed with silky parachutes. In cultivation, this species needs to be kept warm, especially through the winter, so that it can be given sufficient water to retain its roots. It can be propagated through stem cuttings. Frerea indica's natural growth habit of elongated stems hanging down cliifs makes it a suitable subject for a hanging basket, seen here at RBG Kew. Some inter-generic hybrids have been made with Carallumas.